Parents of babies and toddlers often have to make a huge decision whenever they go for a family outing. To bring or not to bring the stroller. While a stroller is infinitely useful to push around your kid, it is also a heavy and bulky piece of equipment when you don’t actually need it. Hence the hard decisions. 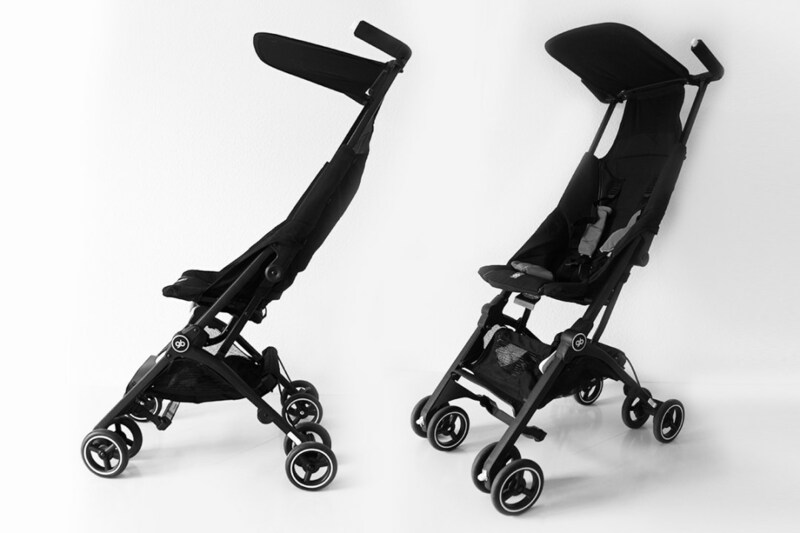 However, with the GB Pockit Stroller, it is so light and folds so compactly, it makes making that decision moot. The GB Pockit stroller is officially listed in the Guinness Book of Records as the world’s most compact folding stroller. When fully collapsed, the stroller measures just under 12 in x 14 in x 7 in. This is small enough to fit in most overhead compartments on an airplane. And it weighs just 9.5 pounds. Amazingly, that is actually lighter than some newborns. It took some incredible feats of engineering to achieve this compact size. We believe it will fit into some of the larger diaper bags. Or alternatively, you can just add a luggage strap to the stroller and sling it over your shoulder. However, no matter how small and compact it folds up, the GB Pockit won’t be winning a lot of fans if it takes a long time to unfold and fold it. Fortunately, the designers of the stroller obviously realize how important this is. To unfold the GB Pockit, all you have to do is to unfold the two handles from the center, press the locking buttons on the handles simultaneously and give the stroller a shake. Lastly, unfold the rear wheels from the bottom of the stroller. To be honest, we did not expect it to be this easy. It literally takes less than 20 seconds. With a little practice, we can probably do it under 10 seconds. How about the other way round? The GB Pockit has 2 folding options. The first is what is called the compact fold. To fold, all you have to do is to lock the front wheels, press the handle buttons and push down. This is not the most compact form but it is a easier and faster yet still compact enough to easily transport the folded stroller. The second folding option is the ultra compact fold. This basically folds the stroller back to its initial form when it comes out of the box. It requires the additional step of folding the rear wheels under the stroller before collapsing the rest of the stroller. For most of the time, the compact fold is going to be good enough as it requires less hassle. You will probably only use the ultra compact fold when storing the stroller away in the car or back in storage at the end of the day. Build and quality wise, the GB Pockit stroller is surprisingly well built and feels like it will last for years. The ultra lightweight umbrella strollers may be lighter but they also feel a whole lot flimsier. The GB Pockit strikes a good balance between a well-constructed, high quality stroller and an ultra lightweight one. The ultra compact folded size is a huge bonus though. With its innovative two-step folding design, the GB Pockit is the Guinness World Records' most compact folding stroller that weighs just 9.5 pounds.